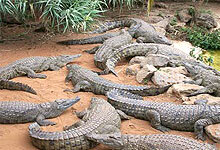 Mamba Village is famous for its Crocodile Farm.The pens are home to an estimated 70 Nile crocodiles. Four Maasai Ostriches can also be found strutting around their pen with grace.Visitors often come into direct personal contact with them when given the opportunity to feed these gallant birds. The experience is always satisfying and exciting especially for children. Nairobi mamba village crocodile farm day tour takes you to the Mamba Village which situated an estimated 13 kilometers away from the city centre. It is off the Lang'ata - Karen road. 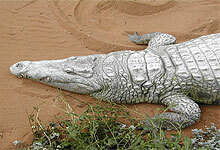 This is a great place to see crocodiles, ostriches, giraffes, and even rabbits in Nairobi. Located on Karen Road, just a few metres from Galleria Shopping Mall, the resort is a perfect getaway especially for guests who are bound to enjoy the boat rides, viewing the crocodiles, feeding the ostriches and other various activities. Another interesting activity is the camel and horse ride. Nairobi Mamba village resort main restaurant has a capacity of up to 300 guests at a time alongside an 'island' buffet space overlooking the man-made lake, which can seat another 120 patrons.